These guys recall, I think, the old home truth that your barber always has a terrible haircut (which doesn’t mean that he or she doesn’t GIVE good cut). Gimme …Gimme…Gimme….you know you have arrived whan you say Kiton…at least for me that is. I’m sure these guys don’t want to wear anything but what their employer makes. Just like 5star hotels, good taste and high quality never EVER go out of style …..I wish my whole wardrobe consisted of this …OK OK OK…I’m simmering down …coming back to reality. everything kiton does is amazing. i love the topcoat on the right. PS- how did your APC jeans turn out? did they end up fitting well? 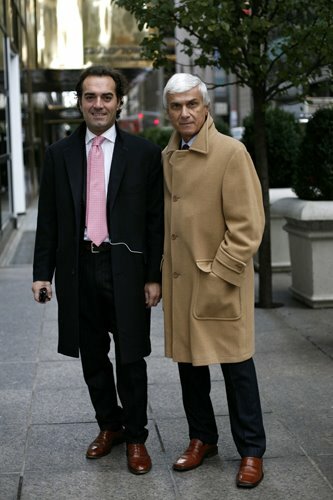 As a tailor I can see way Scott has stopped these guys its beautiful soft tailoring. The way I like it. I LOVE the right jacket. Great post Scott. They look superb. And the older chap on the right best of of all. Those larger pockets on the camel coat adds and edge and his silver hair looks excellent too. The brown shoes add punch to the whole deal. Don’t care what they do for a living – they look like they’re enjoying life. Excellent choice Scott..
is the guy on the left wearing an ipod? As a buyer in the industry working in Spain, I´ll have to say I compliment your good taste and have followed your postings for some time. However, I can´t help but note the conspicuous lack of color in your most recent selections…though I do realize a climate such as NYC does not lend to color creativity this time of year. Beige coat on silver-haired Gent. I want it! Where can I get it? Perfect length and love those pockets! They’re sooo charming and adorable! They both look great, but the fellow on the right looks arresting in his camel coat. Your photos of silver-haired men looking sharp give me hope! These guys really have down their sense of style…except for the one on the left. BROWN SHOES AND BLACK BELT!!!!!!!!!!!!! How gauche. That coat. That pocket. That hair. New Yorkers have an amazing sense of style. They all look so put together. There is nothing as chic as deep dark grey flannels with a soft wool cashmere over coat in the colour beige for the fall/winter. This brings up a question for me, probably easy to answer for most on this site. 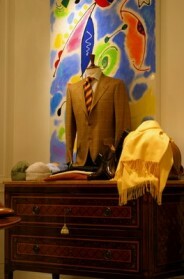 During the fall and winter, how colorful can a tie be? As the leaves turn, I have been less enthusiastic about my pink (or other bright colored) ties. Is that unfair? I’m curious as if these were not Kiton execs if there would have been a picture taken or so many praises. It’s crazy to think that the two of them are walking around in outfits with the combined value of a small car. I think the fact that they work for Kiton has very little to do with why people like or dislike their look. Plotz for that camel coat. Perfection. Who is the older gentleman? I know the younger guy is Antonio, Ciro's son. But curious about the other gent.